Willful as well as physically brave, Lily Ransome is dissatisfied by the options available to her on Unruli: She can either join her family lucrative mining business or begin procreating. When Heredes, her beloved martial arts instructor, tutor, and father figure, is kidnapped by alien bounty hunters, Lily spurns the expectations of her home planet and ventures into space to find him. Befriending a persecuted minority class of humans called the Ridani, she becomes involved in an intergalactic rebellion and finds love in an unexpected place as well as true strength within herself. 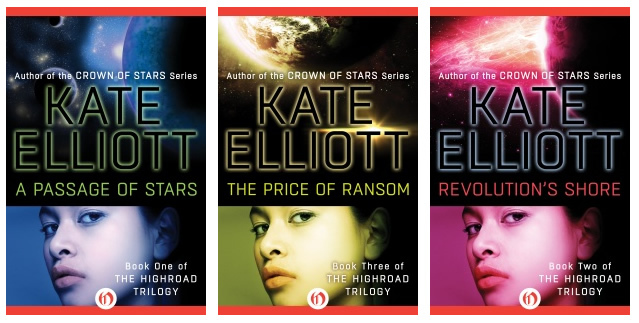 Read excerpts from A Passage of Stars, Revolution's Shore, and The Price of Ransom. "In this first volume of her projected Highroad trilogy, Rasmussen (The Labyrinth Gate ) creates the most delightful robot since R2D2: Bach, who whistles lieder under his cybernetic breath." "[A] fast-paced space opera with a likable, courageous female protagonist."